Solar and wind made huge gains in 2016, as they have ever since President Obama jump-started the industry in the Recovery Act. It’s so disheartening that the Trump Administration and most Republicans believe “Making America Great Again” means returning to a fossil-based, gas-guzzling economy instead of taking advantage of the potential that’s right in front of our eyes. It’s not only about providing energy, it’s about health – free from cancer-causing chemicals that are wrapped up with fossil fuels. Not only did solar job growth outpace the overall US economy by 17 times in 2016, the growth is spread across 44 states, across job types and across the middle class, according to the National Solar Jobs Census. 260,000 Americans are employed by the US solar industry, a 25% increase from 2015 and a tripling of jobs since 2010. If Republicans don’t undermine the industry, jobs are expected to grow 10% in 2017, adding another 56,000 jobs. 26% job growth in manufacturing (38,000 people); 53% in project development (34,400); 32% in sales and distribution (32,147) and 14% in installation (137,133). Veterans hold 9% of solar jobs compared to 7% in the overall US workforce; women hold 28%; African-Americans 7% and Latino/Hispanics 17%. “A wide range of people get hired into this industry, from licensed engineers to those who first learn about a solar project when we build one in their area. A great aspect of this business is that it isn’t an exclusionary trade. It’s a teachable job that can create opportunity for people and give them a skill,” says George Hershman, Senior Vice President at Swinerton Renewable Energy. Looking at other clean energy sectors, energy efficiency jobs rose by 133,000 for a total of 2.2 million jobs, and wind added 25,000 jobs, for a total of 102,000. About a third of the 6.5 million employees in the construction industry work on building energy and efficiency projects, according to the Department of Energy’s U.S. Energy and Employment Report. For the first time, there’s more wind energy installed (82.2 gigawatts) in the US than hydro (80 GW). 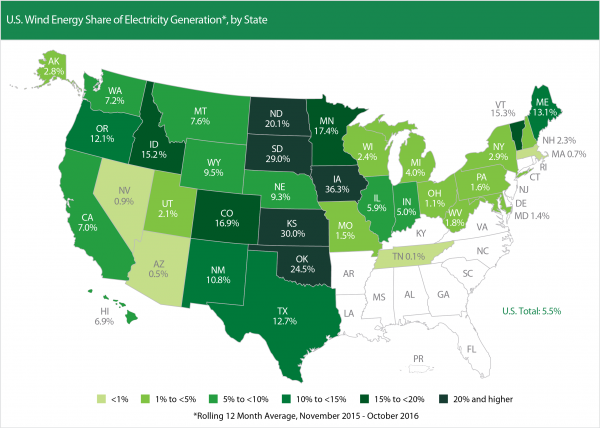 Both Iowa and Kansas get over 30% of electricity from wind, and close behind are Oklahoma, North Dakota and South Dakota with over 20%. Nationwide, wind supplies about 5.5% of electricity, enough for 24 million homes, and if not undermined, it’s expected to provide 20% of our electricity in just 13 years. That means huge middle class job growth – from 102,000 wind jobs now to 380,000 in 2030. People are employed in the wind industry in all 50 states and there are over 500 manufacturing plants in the US, mostly located in those rural and Midwest areas that have lost so many jobs to Mexico and China. Ohio has the most wind manufacturing with 60 factories and Michigan, Wisconsin and Pennsylvania have 26 factories each. Siemens received the world’s biggest turbine order, produced at factories in Iowa and Nebraska. General Motor’s Arlington Assembly Plant in Texas will run completely on wind next year. So, if you are looking to increase jobs for the middle class, wind and solar are staring you in the face. Corporations love wind and solar. Besides, getting clean energy (they live on this planet too), they get stable, low-cost electricity. Making fossil fuels dominant again will not only raise prices, but make them much more volatile as we have seen in the past. Retail electric prices fell 2.2% in 2016; the average person pays 3.9% less per kilowatt-hour than in 2007. Renewable energy is at record levels, with costs for wind and solar continuing to fall. In some states, like Iowa, wind is the cheapest form of electricity. 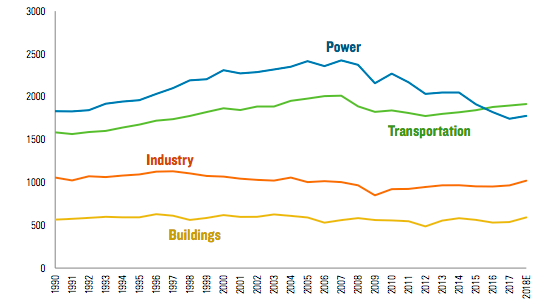 Incredibly, energy consumption is falling even with economic growth. GDP is up 12% since 2007, while energy consumption is down 4%. Natural gas prices are near or at record lows. Because of these trends, the US beats China, India, Mexico and Japan for energy costs related to manufacturing. It’s one of the things that’s been attracting manufacturers back to the US. And with all this, economy-wide greenhouse gas emissions are at the lowest levels in 25 years. Tell me again? Why are we bringing back a fossil-fuel based economy? Yet, Trump and Republicans will turn back the clock on energy-efficient building codes, appliance standards and vehicle fuel economy standards, pushing the US back to over-consumption and reliance on fossil fuels. Why?! I live in Ontario, Canada. We have always had affordable electricity. Ontario was the manufacturing heart of Canada. That ended in 2003 when the Liberal Party of Ontario took control of our provincial government. They passed the Green Energy bill and started building wind farms and solar farms. Then they had to build gas plants to back up the wind and solar energy. Our electricity price has gone from .043 cents per kw hr to .39 cents per kw hr at present. Ontario has lost all of its manufacturing. Companies like Heinz who had been in Ontario for 100 years have left because they could not pay the cost of electricity. 79,000 households have been disconnected from just one electricity provider, Hydro One. I do not know how many people have been disconnected in the province as a whole. I can no longer afford to live in Ontario and am in the process of leaving. I do not find wind and solar energy sustainable.